Ever dreamt of dropping out of the rat race, buying a farm, tending some goats and making cheese? In the recently published Over the Rainbeau: Living the Dream of Sustainable Farming (Rainbeau Ridge, 2009), sisters Lisa Schwartz (farmer and cheesemaker) and Karen Sabath (photographer and farm partner) joined with food writer Judith Hausman to chronicle the romances and realities of living the dream of producing artisanal cheese. 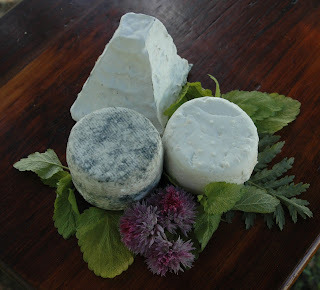 Founded in 2002, Rainbeau Ridge has grown into a multifaceted sustainable farm boasting award-winning cheeses. Rainbeau Ridge is located in Bedford Hills, New York, an hour Northeast of New York City, and includes a small-scale egg operation, organic vegetable gardens, a restored orchard, small pastures and barns designed for the farm’s many animals, and a cheese house, where Lisa cultivates her fine farmstead goat cheese. Lisa Schwartz took time to speak with Gastronomista about her own experiences living the dream. Can you tell us a bit about the history of Rainbeau Ridge? I understand that the farm started as a very small and humble endeavor and has since grown well beyond. I had small garden and chickens when my kids were little but I really started Rainbeau Ridge with just two milking goats. My husband and I had been slowly trying to re-assemble a former country gentleman’s farm and recreating a farm was a way to preserve that land by putting it to work. When we got back from four years of living in Japan, I was ready for the next chapter in my life and felt an overwhelming desire to create something with my own hands. Goats seemed manageable and I felt cheesemaking would bring together many of my interests in nature, the land and feeding people. There are a lot of prominent women in the cheesemaking business. Why do you think that is? We get asked this all the time -- honestly I don't know. I do know there are many traits that a successful herdswoman and cheesemaker must have that women tend to excel in -- but that makes it sound very sexist…Historically, the family cow, flock, etc. were tended by the wife/mother-- are we being called back? Does our own ability to give milk call us back too? This also sounds sexist. We banish most male animals from the farm -- boys get scared off -- here I’m just kidding!!! How has the market for artisanal cheese changed and developed since you started out? It's amazing but the US market bloomed 20-30 years ago with people like Laura Chenel and Allison Hooper. They opened the doors for many of us-- but even in the last 10 years, the growth in the segment has been exponential. Consumers are really getting it, becoming more discerning and the number of new players is impressive as are their cheese. What sort of courses, tools or resources would an aspiring cheesemaker need to get started? Ricki Carroll of New England Cheesemaking is the mother of many artisanal cheesemakers. I took one of her workshops in Western MA early on and she has a great supply house too, from which you can order the basics. I noticed that you sell goats on your website. 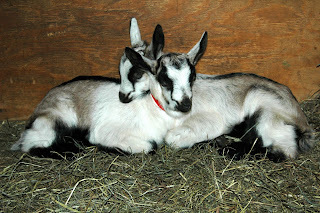 What resources are required for raising your own goat? And what are goats like, anyway? Are they nasty, sweet, ornery, somewhere in between? Well, you’d start by finding out what your town regulations are concerning livestock. The goats need some protection from the elements and require hay, grain and water daily. They don’t eat cans but they can earn their keep by eating brush and invasive plants. There are herds kept for just that purpose. Our kids are handled from the time they are born so for the most part, they are gentle and friendly although there is an occasional doe that likes to push at me or nibble a scarf. When developing new cheeses, where do you take your inspiration? I was always interested in French-style cheeses but when I try a cheese I like, I do fantasize about capturing or interpreting those qualities with my facilities, with my milk and my farm’s terroir. Where did you train in France and how did that experience affect your outlook on food? In Poumoue, a tiny town in Central France, on a farm where the Johanneaux family made wonderful chevre and ran a small restaurant. I worked along side them, filled notebooks with notes and drawings and asked questions. Even with just my high school French, I learned so much about eating seasonally and simply. We picked the salad for lunch along the stone paths back to the farmhouse. But it was really much earlier during my four years in Japan, absorbing that culture’s celebration of food, eating locally and seasonally, that I began thinking differently about food. Can you tell us a bit about cheese competitions? What are the judges looking for? How are you evaluated? How many people enter? There are many competitions-- the one I admire a lot is run by the American Cheese Society, whereby a pair of judges (one for technical evaluation, the other for aesthetics) awards points and the top point winners over certain thresholds receive awards. I'm proud to say that our Meridian took 3rd in 2008 (the first time we entered) and ChevreLait took 2nd in 2009. There were 1300 entries overall this past year. We have been buying some amazing raw milk and cream at underground raw milk clubs. In your Martha Stewart segment, you briefly touched on your methods for approximating raw milk. Do you think dairy farms should be able to sell raw milk and raw milk cheeses? If so, with which restrictions? I think that consumers should be able to choose pasteurized or raw milk cheese. There are clear taste differences and when done properly, clean raw milk produces lovely cheese. Having said that, there are farmstead cheesemakers of all quality levels -- some cleaner than others -- so safety is a big consideration. The fabrication of farmstead cheese can be carefully monitored for cleanliness because everything happens within the farm. We know our animals, our team members, our cheese house routine and are inspected monthly. Nevertheless we will continue to comply with the pasteurization for our fresh cheese. Should we venture into aged cheeses, it would be my hope to age over 60 days so we could use raw milk for the input. Just for the record, contamination can happen post-pasteurization so it's not a panacea. How do you eat your cheese? Every which way. When I was still learning my craft, I'd have so much cheese, I'd cook with it constantly and my kids used to ask where I’d put the cheese in every dinner. It’s the best, healthy “fast food” ever when combined with the garden produce on a great slice of bread. There's "nothing doesn’t go with goat cheese". For information on special events at Rainbeau Ridge, incluing cooking classes, garden workshops, kids programs, and internship opportunities, visit http://www.rainbeauridge.com/.